As with most music festivals, I went into the week at SXSW having a list of artists I had seen before and wanted to see again, but the true beauty of any festival is stumbling across some gems that you’ve either never seen before, or never even heard of. With hundreds of showcases and more than a thousand artists, SXSW offers the best opportunities for music fans to discover their new favorite bands, and this year I definitely found a few new personal favorites. 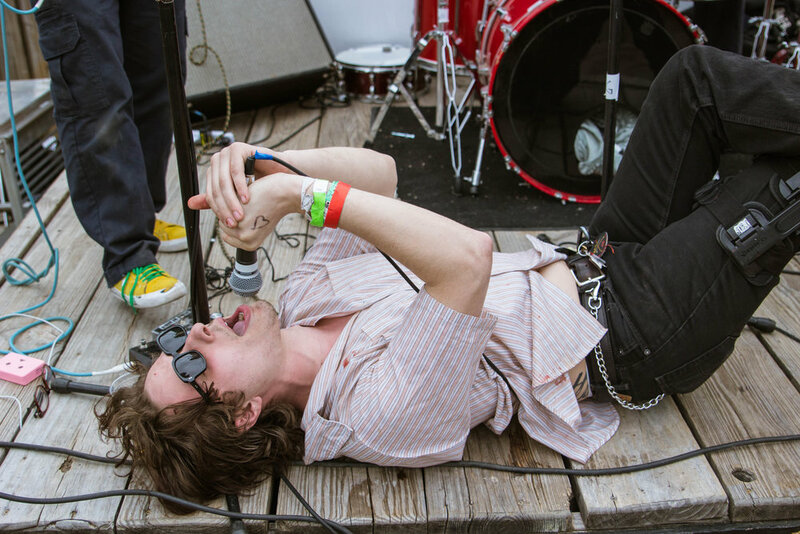 Read up on the nine best new bands I caught at SXSW 2019 below! I caught a great set from Scottish rock band Fatherson on my first night in Austin, on March 12th at Seven Grand. 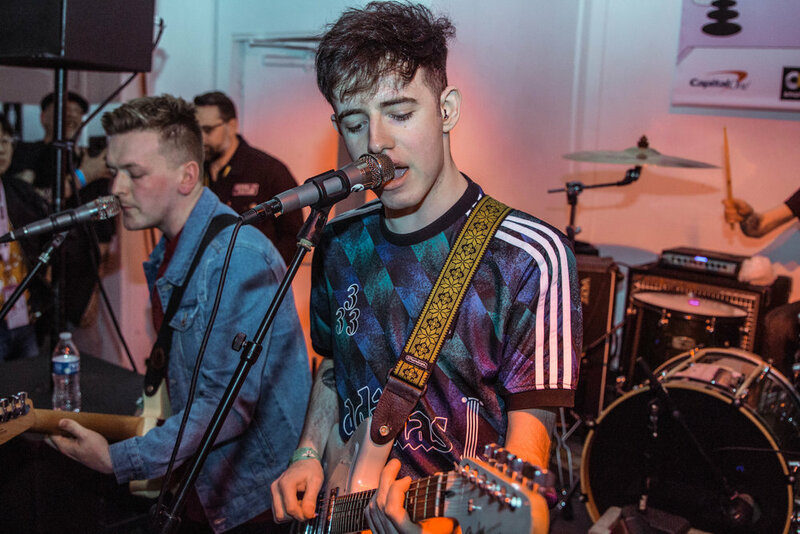 The Kilmarnock-based trio fronted by Ross Leighton have actually been around since 2010 and toured with the likes of Biffy Clyro, Frightened Rabbit, Panic! at the Disco, and Enter Shikari, but this year marked their return to SXSW for the first time since 2015, and I finally got the chance to see them perform this time around. Throughout their set at Seven Grand, the bandmates seemed to have this sense of ease and chemistry between one another, which perfectly complimented Leighton’s powerful, yet silky vocals. Listen to Fatherson’s 2018 album Sum of All Your Parts here and see where they’re playing next here. Swedish musician Åsa Söderqvist— AKA ShitKid— took the stage at the wee hour of 1AM on March 12th at Cheer Up Charlie’s indoor venue, and while she and the audience theoretically should have been exhausted from a full day of music at that point, no one let on and the room buzzed with an electric energy during the entire set, proving you shouldn’t ever judge a band by their name. Söderqvist and her bandmate kept the crowd entertained throughout their set with different antics; whether it was dismantling the drum set on stage, climbing ledges around the room, or lifting their instruments above their heads, there was never a dull moment during the show. Unsurprisingly, the crowd begged for an encore song from ShitKid, but unfortunately the venue curfew didn’t allow for their demands to be granted. Keep up with ShitKid’s upcoming tour dates here. Easily one of the most buzzed about bands at this year’s festival, the Dublin-based Fontaines D.C. put on a show well worth the hype. I had the pleasure of seeing them perform twice, for the first time on March 13th at Swan Dive, which drew a huge crowd and a line out the door. The band’s collective stage presence had this juxtapositional sense about it, with lead singer Grian Chatten coming across visibly anxious as he paced the stage on his tip toes and bit his fingernails, while his bandmates would thrash around the stage or climb up on the amps during the show. The dynamic worked really well and had everyone hooked, and towards the end of the set, a large mosh pit started going for the Irish punk band. Fontaines D.C. returns to The States later this year for a tour with Idles— dates here, and you can listen to their latest single here. Another great export from across the pond at this year’s SXSW: Glasgow’s The Dunts. The four-piece formed in late 2016, but have already garnered plenty of buzz around their sound and live performances, which has earned them past slots at Reeding and Leeds festival and upcoming slots at UK Festivals this summer. Their guitar-driven tracks and rowdy stage presence blends perfectly with their catchy choruses and guaranteed-to-get-stuck-in-your-head melodies. 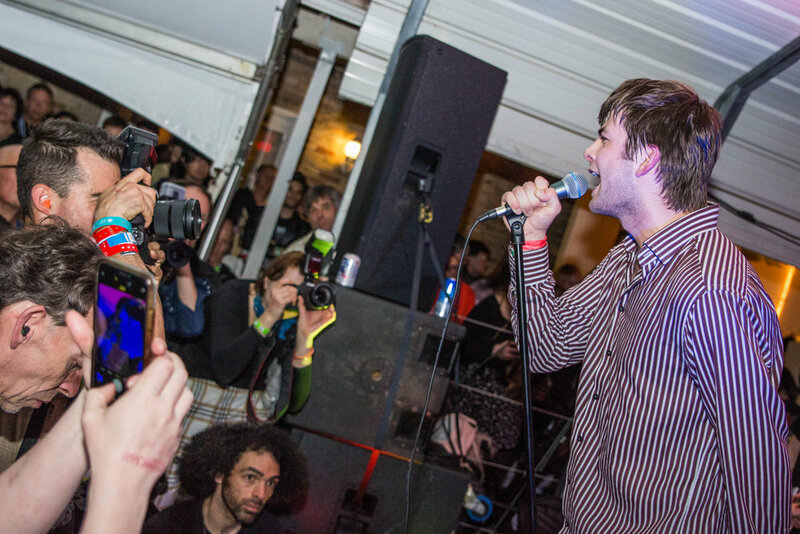 Although this was their first ever SXSW, both of their performances that I caught (on 3/13 at The British Embassy and 3/16 at 720 Club) drew in very large crowds of enthusiastic fans. Stay tuned for an interview with The Dunts coming soon, right here on ANCHR! I was lucky enough to catch Black Belt Eagle Scout, the project of singer, songwriter, and multi-instrumentalist Katherine Paul, on Friday, 3/15, when I arrived to a venue early for HÆLOS’ final set of the festival. While I had never had a chance to listen to Black Belt Eagle Scout’s music, Paul and her bandmates instantly won me over with their live show, which kept the audience on their toes with a dynamic performance. The set had more delicate, softer moments that lured the audience members in, but Paul and her bassist also didn’t pass up the opportunity to shred. Black Belt Eagle Scout will tour with Julia Jacklin in April and May, including an already sold out show at Schubas Tavern on May 8th. Full dates here. Montreal’s Pottery hasn’t been around long at all, but they had large crowds at both of their sets that I attended. Blending together elements of different genres—from surf rock to post-punk to krautrock— there’s a special element to their sound that you just can’t put your finger on, but it made the perfect soundtrack for Friday afternoon when I first saw them at a Cheer Up Charlie’s day party. So far Pottery has only released two singles, but based on their live shows, their future releases will be worth the wait. See where you can catch the new band on tour next— upcoming dates here. 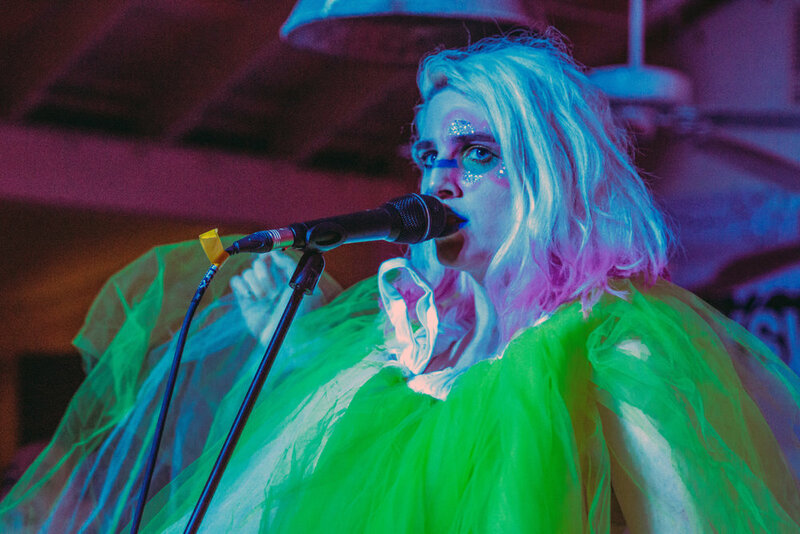 For the Father/Daughter Records showcase on Friday night, Sir Babygirl (the moniker for musician Kelsie Hogue) went all out with her stage presence; face paint, a full getup featuring a tutu-esque cape, and back up dancers. While that performance was completely captivating and demanded the audience’s attention for obvious reasons, I also had the chance to catch a solo, acoustic set from Sir Babygirl on Sunday afternoon, and Hogue’s stripped-back performance commanded the room just the same as the first time I saw her perform. As a songwriter and performer, Sir Babygirl exudes her message so clearly and so powerfully that you can’t help but listen and appreciate. Keep up with Sir Babygirl updates here. SXSW-goers packed in Cheer Up Charlie’s indoor room for a rambunctious show from New York’s Native Sun on Saturday night, 3/16. While the four-piece was another one of buzziest bands this year, my first time seeing them only exceeded my expectations. Between the crowd surfing that occurred in the low-ceiling venue and lead singer Danny Gomez jumping off stage while the rest of the band let loose onstage, I think it’s safe to say everyone in the room had their adrenaline pumping at the end of the set. Keep up with Native Sun here and stay tuned for our interview with them. I got the chance to finally see one of Gnarcissists’ many SXSW sets on Saturday, 3/16, at Spider House, and besides being one of the best new bands I saw, their set was one of my all-time favorites at SXSW. Although this set was near the end of the long week, the band members cranked up the volume and still poured all of their energy into this performance. Refusing to remain confined to the stage set up outdoors at Spider House, the band jumped offstage to play amongst the crowd that had gathered to watch the care-free gig. Keep up with Gnarcissists’ upcoming shows and announcements here.